Inder Loves Folk Art: Train tunnel. The other day, when we were all just trying to keep moving in order to ward off the chill,* I decided to turn a big shipping box into a little house for Joe. Well, I thought it was going to be a little house. I put a window in it and everything. But Joe had other plans. He didn't want to get inside it or set up his dolls in there (who was I kidding? his baby doll is currently buried up to its neck in the back yard). 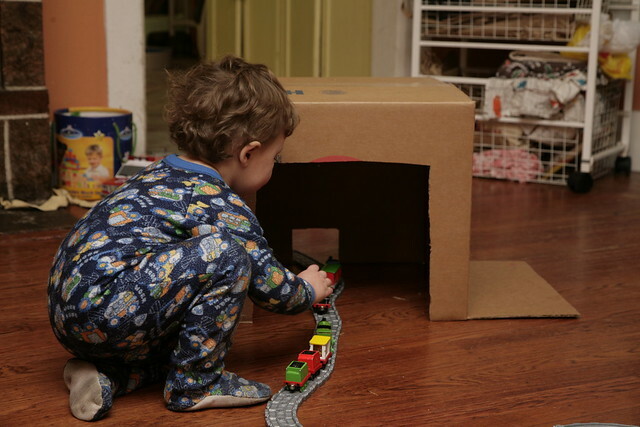 He wanted to push his trains through it. Duh. So I cut out a little opening on the other side, making it the strangest looking "fway** tunnel!" you've ever seen. Can I just say that my cardboard crafting skills leave a lot to be desired? Wow. Martha makes it look easy (to state the blatantly obvious). 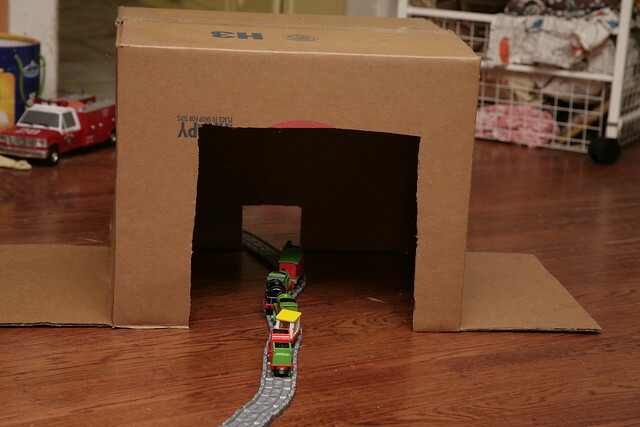 My cardboard box house/tunnel looks like total crap. I'm going to blame that on lack of appropriate tools. Yeah. I'm sticking to that story. But he likes it. And it was free. And it kept my hands from getting frostbite for a few minutes (however, the exacto-knife did give me a blister; cutting sturdy cardboard is not as easy as it looks, see above). So. Anyway. I'm reminded once again that it is usually not the most expensive toys that children like best. * We finally buckled and turned on the heat. Just in time for temps to dip into the low-40s last night (which isn't so bad if your bedroom is not also that temperature). That means, according to this table, that in just the past week, we have seen 40 degrees of variation in temperatures. Nutso. Can we go back to 80 degrees, please? Heck, I'm not greedy - I'd be happy with mid-60s. High of 81, low of 41. ** "Fway" = Train. The speech therapist calls this "consonant cluster substitution." Some children will substitute easier consonant combinations for more difficult to pronounce clusters. Which is why it's really funny when Joe says "fway track!" Hey, your cardboard cutting skills look pretty good to me! Carolyn: Where are you located? Aren't you in the Pacific NW? It's a bit cooler up there than here. Anyway, last week was a big struggle: cold vs. frugal. As soon as we turn on the heat, our PG&E bill goes through the roof. So for a while, frugal was holding out. But then the temps went down into the 40s this past weekend and we cried "Uncle!" I love 'fway track' - I think they get into habits of saying things a certain way and that becomes the real word for them - it's not consonant cluster substitution, it's just a fway, dummy! What's with the semi-interred doll? Jane: Joe has several words he pronounces wrong even though he clearly knows how to pronounce the sounds correctly: train is "fway," milk is "gulky," our dog Crouton is "dashon" (but I think we're going to change his name to Dashon permanently, because that is just too cute). I think it's habit, like you say. I got him a baby doll because I know boys and girls like to play at nurturing, and we're modern like that, right? Well, it went straight outside to the sand box with the dump trucks and gets buried a lot. I dunno. I love the tunnel - and kids couldn't care less about how pretty something looks! Fway is super cute - the speech pathology thing is interesting - my (much younger) cousin always called me 'Dadis' - my name's Justine!